Did you know that your home’s air conditioning system loses approximately 5% of its efficiency every year that it runs without a tune-up? 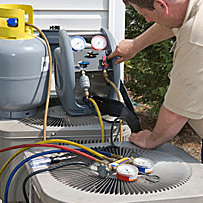 At Schumacher and Farley our air conditioning technicians are tune-up experts. They go through your a/c system from the inside out, tuning up all aspects of the machinery and equipment in order to ensure that your system is operating at its best. Call Schumacher and Farley today to book your air conditioning tune-up today. Call with confidence – all of our central air services are backed with a 100% satisfaction guarantee.